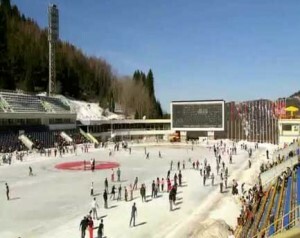 The Medeo outdoor ice skating ring is designed as a huge speed skating and Bandy area. Bandy is a team winter sport played on ice, in which skaters use sticks to direct a ball into the opposing team’s goal. The statistics of the ring are really impressive. It is located on the eastern outskirts of Almaty at an altitude of 1,69o metres and has an area of 10.5 thousand square meters of ice. The altitude has made the ring the highest skating ring in the world.